Over a year ago I took on a new professional challenge as the director of digital learning, technology, and innovation in the Milford (MA) Public Schools after 11 years as a school principal. At first it was difficult to sift through the buzzwords and jargon to focus on tools and strategies for bringing about the shift to digital learning. I kept hearing very different definitions of blended learning. Over the past months I’ve learned a lot from other staff members and have attended multiple blended learning sessions, in addition to reading on the topic. And I’ve come to the conclusion that giving educators strong support and examples is the best way to support a blended learning instructional strategy that will create active learners. I’ve seen that the more engaged students are, and the more active a part they take in their own learning, the more likely they are to earn higher grades and test scores. It makes perfect sense that students who are participating more and involved in active learning will have higher content retention. Knowing this, teachers can shape curriculum and instruction to maximize engagement by increasing student participation. One of the keys to academic achievement, then, is active learning. 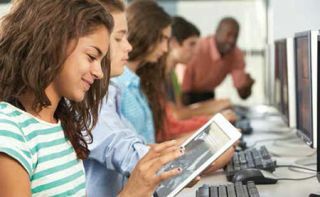 Research tells us that personalized, collaborative, and connected learning experiences enhance student engagement, which in turn drives student success. By integrating blended and digital learning into the classroom, educators can take learning experiences to the next level and improve student performance. According to its most basic definition, blended learning is an instructional methodology that combines face-to-face classroom methods with digital activities. Ideally, in a blended classroom students will be able to learn according to their unique learning styles. Students often take different approaches to interacting with the same curriculum. Some are happy to express themselves verbally, while others prefer to write. Some don’t like to be in front of a camera. When teachers can use a variety of instructional tools and apps, they can help every student focus on his or her strengths. Educators can use the following blended learning tools to increase engagement and help create active learners. EDpuzzle: EDpuzzle enables users to select a video and customize it by editing, cropping, recording audio, and adding questions to make an engaging presentation or lesson. EDpuzzle is an easy-to-use video platform that helps teachers save time, boost classroom engagement, and improve student learning through video lessons. EDpuzzle also collects data as students watch and interact with the video. Best of all, it’s completely free. ■ Poll Everywhere: This versatile, clicker-free classroom polling tool can be used to encourage student participation and gather instant responses and data for discussions. ■ Popplet: Popplet can be used with an iPad or on the Web to capture and organize ideas. As anyone working with middle- and high-school students will know, any help with organizing ideas is useful. ■ Kahoot! : Kahoot! is a game-based blended learning tool that’s easy to use and enables educators to assess learners on a visual bar graph while students take control of their own learning. The platform is entertaining and encourages student creativity. ■ Screencast-O-Matic: This powerful screen recorder allows users of the free version to capture anything happening on their screens, as well as voice and video from their webcams, for up to 15 minutes. Students can record videos describing, for example, how they solved a particular problem step by step. Screencast-O-Matic could also be helpful for delivering lessons, for student projects, or for allowing students choice in an assessment of knowledge. ■ Write About: One key to improving student writing is to have students write more often, and this tool can assist with blended writing lessons. While time constraints often limit the amount of feedback teachers can provide, Write About provides students with an online space to write on high-interest topics and get feedback from their peers. Write About can also be combined with G Suite so teachers can use the Write About prompts and Google Docs to share content, give feedback, and watch student writing evolve over time in response to real-time feedback. Blended learning is an instructional strategy that equips teachers with technology tools to enhance learning, engage students, and create active learners. Matthew X. Joseph Ed.D (@milford_tech ) is the director of digital learning, informational technology, and innovation at Milford (MA) Public Schools.